Nemesis is a Diabolic. A creature created for the soul purpose of protecting their person. When Sedonia, the person Nemesis exists for, is in danger Nemesis becomes her in order to save Sedonia’s life. But by becoming Sedonia, Nemesis is trapped in a world of politics and deceit. As she navigates the dangerous world of the elite, Nemesis has to find out just who she can trust whilst maintaining her assumed identity. The Diabolic has been one of my most anticipated reads of 2016 and it was worth the wait. Nemesis is an interesting character to follow. We are made clear at the beginning that she’s not human. Bred to protect – she would do anything (and I mean anything) to keep Sedonia from harm. Deadly and inhuman, Nemesis seems to have no redeeming qualities apart from her love of Sedonia. But when Nemesis takes Sedonia’s place and interacts with the universes upper class, Nemesis learns there is more to humanity than being born human. The cruelty she witnesses and the deadly games they play prove just who the real monsters are. I loved the contrast between the political elite and the Diabolics. The world building in this book is amazing. From their outward looks to what makes them human – throughout the book there is a sense of how deceiving appearances can be. Science as we know it has been abolished with a new way of life being followed. These character have their own technology where just about anything and everything can be faked. When it comes to the plot, there are a lot of twist and turns as Nemesis masquerades as Sedonia. With the risk of her true identity being revealed at any moment and the fatal repercussions that would have on everyone associated with Sedonia and her family – there is as sense of danger and anticipation on every page. This is a book where bad things happen and they need to in order to keep the suspense alive. There is a slight romantic storyline in The Diabolic but it doesn’t interfere with the overall plot. Nemesis never loses sight of her purpose and her love for Sedonia, her need to protect her from any and all threats, is her focus. It makes for an interesting read and I loved that Nemesis was true to who she was whilst at the same time she showed growth over the course of the novel. The worst thing about this book is the lack of a sequel. Standalones are great but in this case I didn’t want to leave The Diabolic’s universe. I’m going to cross my fingers and hope that the author will find her way back to this world and give us another instalment. Fans of The Hunger Games, Spark by Rachael Craw and The Jewel by Amy Ewing will find much to love in The Diabolic. There’s disruption of social classes, political games, and science fiction elements which are both interesting and exciting. The characters are engaging and make you want to learn more about them and the world they live in. The Diabolic is a great addition to the YA literary scene. This is a book which deserves all the hype it has received plus more. I can’t wait to see what SJ Kincaid writes next and recommend this book to anyone who like dystopian YA novels with a difference. 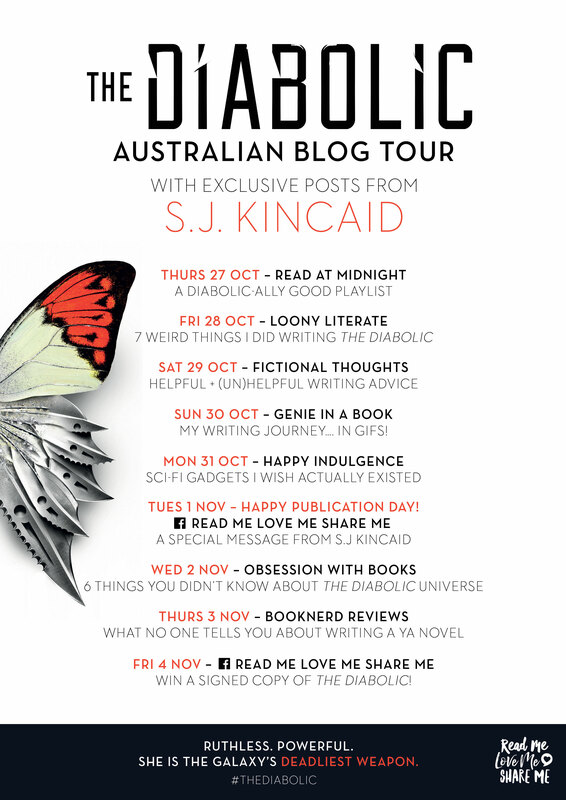 If you enjoyed my review for The Diabolic, be sure to check out my guest post by SJ Kincaid where she shares some of the Helpful and not so helpful advice she got whilst writing The Diabolic. S.J. Kincaid originally wanted to be an astronaut, but a dearth of mathematical skills turned her interest to science fiction instead. Her debut novel, Insignia, was shortlisted for the Waterstones prize. Its sequels, Vortex and Catalyst, have received starred reviews from Kirkus Reviews and Booklist. She’s chronically restless and has lived in California, Alabama, New Hampshire, Oregon, Chicago, and Scotland with no signs of staying in one place anytime soon. I feel like this book would confuse the heck out of me. I don’t do well with split or dual personalities and such, so this book is probably not going to grace my shelves. Sri-Fi is just not my kind of thing. :/ I’m glad you loved it, though! It’s not that confusing because it isn’t a split personality. It’s a case of impersonating someone else. And that person is off on a distant planet so they don’t need to avoid each other or any of that stuff.